click,click: Turn one of your facedown installed cards faceup. If that card is an event, trash it. "Its only function seems to be repurposing code." "Can you kill it?" she asked. "I can try," he said. Guiding his program dead center of the mass, he plunged, piercing the shell before an eruption sent his screen into static. He jacked out, his eyes wide. "I... I think it absorbed my breaker. And everything else." Can Apex: Invasive Predator use Assimilator to obtain non-virtual resources? What happens if the Runner uses Assimilator to flip up a console while a console is already installed? The console flipped up by Assimilator is immediately and unpreventably trashed. If Assimilator flips up a program that causes the Runner's rig to exceed their memory limit, does the flipped program have to be trashed? No. If the Runner ever has insufficient MU, they choose which program(s) to trash. 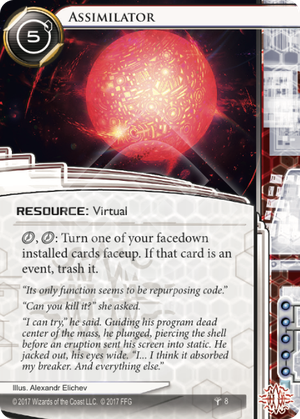 If Assimilator flips up a card with a "when installed" ability (e.g. Daily Casts or Femme Fatale), does that ability trigger? No, the card is already installed. If Assimilator flips up a Cyber-Cypher that was installed with Apex or Hunting Grounds, does the server restriction still apply even though a server has not been chosen? No. The server restriction is part of the "when installed" ability; thus, Cyber-Cypher can be used on any server. If Assimilator flips up a Cyber-Cypher that was installed and then turned facedown with Apocalypse, does the server restriction still apply for the previously chosen server? No. When Cyber-Cypher was turned facedown it became inactive, so its previous state no longer affects the game, even if later turned back up. If Assimilator flips up a current event, is that event still trashed? Yes. The ability on a current event stops the event from being trashed after resolution, it does not stop other card effects from trashing the event. If I am reading it right, this card will let Apex use non-virtual resources. Runner cards that are installed or turned facedown do not have a name, type or a subtype, and their abilities are not active. So it seems Apex can install virtual resources facedown with his ability, then use Assimilator to flip them faceup, bypassing costs and install restrictions. I definitely want to use this to get an Aesop's Pawnshop into play! Mass-Driver is rather situational (2 per sub but you get to ignore up to 3 subs on the next piece of ice) but if it works it's really quite nice. I wouldn't use it without something like Inversificator to help shape the ice though and that means a heavy import price. Morning Star is a very efficient (though memory hungry) fixed strength fracter: 1 for any number of barrier subs as long as that barrier has strength 5 or less (good thing for the corps that Parasite is gone, Ice Carver isn't however). Inversificator is on the cheap side of what I'd call expensive (the 6+ range) but it's an excellent breaker (and restricted). Hardware has seen some of its most expensive pieces go away in the rotation as well, but the all time biggest credit eater is still there: Monolith. It doesn't synergize very well with Apex since the ability to prevent brain or net damage is worse than what Heartbeat already gives you but the 3 is nice and I guess it's at least a nice surprise during a game to turn up a hugely expensive console. Oh, wait. Console. Right... Yeah, it doesn't synergize with Apex at all unless you want to skip on Heartbeat and you don't want to skip on one of the absolute best Apex cards. Ignoring the consoles the most expensive hardware is Adjusted Matrix. I guess it could be nice in the right deck, having the option to click through ice could help when Endless Hunger doesn't quite cut it. On the resource side Rachel Beckman is nice. The shards (Eden, Hades and Utopia) were already available to Apex (virtual) and could already be installed without cost under certain circumstances, but having a way to buy them for a few clicks and otherwise leaving them as fuel is good for Apex. Plus the shards (and Beckman) are only 1 influence so they won't bust the budget. Liberated Account becomes much more efficient if you only pay for it. Laguna Velasco District and Professional Contacts are also interesting, especially given Apex' need to draw cards. A somewhat circular but slightly amusing option is to save 5 on installing Assimilator. Just in case you wanted to have a second one handy. Aside from the expensive stuff Assimilator is perhaps even more effective just doing its thing in your deck since it lets you replace + X to install a card normally by Apex ability + . I don't expect this to be a complete game changer that will make Apex viable on a championship level, but my gut feeling is that it will make building a somewhat competitive Apex deck a lot easier. Addendum: What I forgot to mention is that Assimilator has a small but nice effect on the game. It lets Apex have more hidden information in the form of face down cards. Normally only the corp lets their opponent play a guessing game. Addendum 2: There's also a nice benefit with Apocalypse in that if you have an Assimilator on hand when you Apocalypse you can recover much faster from it than the corp by flipping your most valuable cards face up again. Install non-virtual resources : Aesop's Pawnshop, Film Critic, etc. - Programs : Morning Star, Mass-Driver, etc. - Hardwares : Blackguard, Security Nexus, etc. - Resources : Rachel Beckman, Hades Shard, etc. Cause facedown cards do not have name, type or subtype, and their abilities are not active; you can install and "faceup" them without their "install" restriction. No damage for cybernetics : Brain Cage, etc.